Olay Regenerist is about delivering real results without resorting to drastic measures and it has taken decades of research by Olay's scientists to identify the best-performing and most proven ingredients. Olay was the first mass skincare brand to use peptides, the key ingredient in Olay Regenerist is the Amino-Peptides Complex (Pentapeptides) which is 8 times more expensive than Platinum.The Olay Regenerist collection includes anti-ageing skin ingredients to change the way you age.Use Olay Regenerist line skin care products for a younger-looking skin. Olay Regenerist Cleanser, 100g - Olay Regenerist Cleanser helps to thoroughly cleanse the system and the silica beads exfoliate the skin's surface. Olay Regenerist Microsculpting Serum, 50ml - Olay Regenerist Advanced Anti Ageing Micro-Sculpting Serum helps bring noticeable firmness to face, neck and dEcolletage after 5 days. Olay Regenerist Day Cream SPF15, 50g - The rich and non-greasy formula of Olay Regenerist SPF15 provides optimal hydration during the day and protects skin against the harmful UVA/UVB rays for younger looking skin. Explore the entire range of Combos @ Nykaa available on Nykaa. 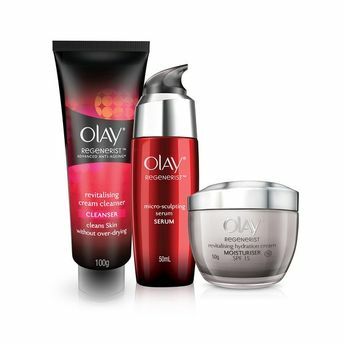 Shop more Olay products here.You can browse through the complete world of Olay Combos @ Nykaa .